HyGain is a well known brand which belongs to MFJ Enterprises. Under this brand name a range of efficient antennas and powerful antenna rotators is offered for ham radio and professional services. Not without reason the HyGain shortwave verticals are very popular are widely used. 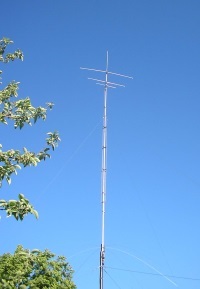 The AV-6xx verticals do not require tuned radials or long counterpoise wire, and therefore take up only very little space. Nevertheless, these antennas have the typical low take-off angle of verticals, making them well suited for DX. The operating principle is based on an end fed 3/8 λ radiator, which is resonant at the respective amateur radio bands. For this purpose, the relatively high impedance at the end of the radiator is transformed by a wide-band transformer to about 50 Ω. The transformer is a 4:1 voltage balun followed by a 1:1 current balun (choke). In addition, several 180cm long wire spokes are used at the base of the antenna as a counterpoise whose capacity also helps to reduce and better match the impedance. The radiator itself is grounded, static charges are grounded immediately. Nevertheless, additional protection measures for lightning strike surge absorption should be taken. The design of the Hy Gain AV-6xx verticals is that the center conductor carriers several λ/4 stubs for the higher bands (6 to 17m). The high impedance at the upper end of the stub effectivly blocks the radiation, limiting the total length to 3/8 λ per band. Each band can be tuned individually. The longer bands are tuned to 3/8 λ by means of parallel connected coils and capacity hats. Due to the parallel connection of the coils again each band can be tuned individually. Further this design with a coild and a capacity hat has lower losses than traditional traps. The mounting of a AV-6xx vertical is very flexible. 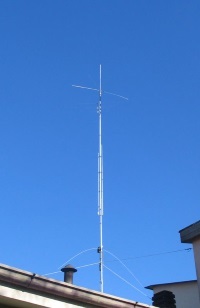 The antenna can be mounted at the side or on the top of a building. The only requirement is that the counterpoise spokes do not touch the roof or snow. In general the manufacturer recommends to mount the antenna c. 250cm above ground. An installation even lower than that at 150cm would work as well, but then the counterpoise spokes must be protected against contact for security reasons. The antennas are constructed to withstand a windspeed of up to 120km/h without guying. Nevertheless the manufacturer recommends the use of guy wires, especially when installing the antenna at extreme heights, close to the sea or at other exposed locations. The guy wires must be non conducting, an installation at about 430cm above the base of the antenna is recommended.